United Arab Emirates is all set to take on Zimbabwe on Friday, April 12, 2019, at Harare Sports Club, Harare. 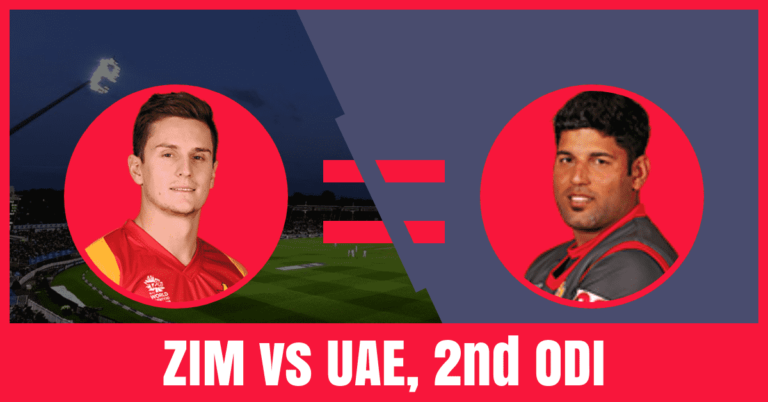 If you are looking for UAE vs ZIM Dream11 Prediction then you are at the right place. We have covered all the details that you need to win any fantasy cricket leagues. You can find predicted playing 11 of ZIM vs UAE 2nd ODI, players recent and past performance, players injury updates, the best choice for captain and vice-captain, pitch report of Harare Sports Club, Harare, weather report of Harare, who will win today, the United Arab Emirates vs Zimbabwe full squad, Dream11 free grand league teams. Zimbabwe has won the toss and opted to bowl first in the first ODI. They have capitalized the decision by restricting the opposition in 110/10. The Zimbabwe team easily chased the low total in 23.1 overs losing only 3 wickets. Craig Ervine and Regis Chakabva were the top scorers of Zim team. They have scored 51 and 38 runs. Tendai Chatara took 3 wickets and Kyle Jarvis, Donald Tiripano, Brandon Mavuta took 3 wickets each. On the other hand, United Arab Emirates failed to deliver in all the departments. Mohammad Boota was only the player who contributed with the bat. He scored 36 runs. Qadeer Ahmed, Rohan Mustafa and Imran Haider took one wicket each. Rohan Mustafa, Ghulam Shabbir, Chirag Suri, Shaiman Anwar, Mohammad Boota and Mohammad Naveed are the key players of United Arab Emirates Team. Mohammad Naveed will lead the UAE team. Despite losing the first ODI, UAE may play with the same playing XI. Mohammad Boota, Shaiman Anwar and Muhammad Usman will lead the batting department. Imran Haider, Qadeer Ahmed and Sultan Ahmed will lead the bowling department. Rohan Mustafa and Mohammad Naveed will play as a key all-rounder. Rohan Mustafa and Ghulam Shabbir (wk) are the most valuable players of the United Arab Emirates Team. Batsmen: Shaiman Anwar, Muhammad Usman, Mohammad Boota, Ashfaq Ahmed, Chirag Suri. All-Rounders: Rohan Mustafa, Mohammad Naveed. Bowlers: Sultan Ahmed, Qadeer Ahmed, Imran Haider. Mohammad Naveed (c), Ashfaq Ahmed, Imran Haider, Chirag Suri, Shaiman Anwar, Rohan Mustafa, Mohammad Boota, Ghulam Shabbir (wk), Qadeer Ahmed, Muhammad Usman, Amir Hayat, Sultan Ahmed, Zahoor Khan, CP Rizwan. Solomon Mire, Craig Ervine, Sean Williams, Regis Chakabva, Tendai Chatara, Kyle Jarvis, Donald Tiripano and Brandon Mavuta are the key players of Zimbabwe Team. Peter Moor will lead the ZIM team. Zimbabwe may play with the same playing 11. Solomon Mire, Craig Ervine and Regis Chakabva will lead the batting department. Sikandar Raza and Sean Williams will play as a key all-rounder. Tendai Chatara, Kyle Jarvis and Donald Tiripano will lead the bowling department. Solomon Mire and Craig Ervine are the most valuable players of Zimbabwe Team. Batsmen: Solomon Mire, Craig Ervine, Peter Moor, Timycen Maruma. Bowlers: Tendai Chatara, Donald Tiripano, Brandon Mavuta, Kyle Jarvis. Peter Moor (c), Brandon Mavuta, Solomon Mire, Elton Chigumbura, Regis Chakabva (wk), Sikandar Raza, Tony Munyonga, Sean Williams, Kyle Jarvis, Craig Ervine, Tendai Chatara, Timycen Maruma, Ainsley Ndlovu, Chris Mpofu, Donald Tiripano, Brian Chari. You may like to read IPL Prediction. The pitch of Harare Sports Club, Harare will favour the fast bowlers, especially in the first inning. the batsmen may find it difficult to score runs in the initial overs. UAE vs ZIM Dream 11 Fantasy Cricket Tips: Try to take fast bowlers and middle-order batsmen in your team.